CHALKBOARD LABELS – Each set includes 32 chalkboard labels (16 x round and 16 x rectangular). 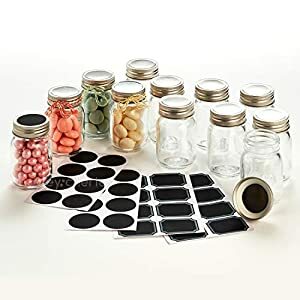 Giving you the option to label the lids and/or the sides of the jars. They are easy to write on with chalk markers and can be wiped clean with a damp cloth. Permanent markers can be used if you do not wish to change the label name. WON’T LEAK – There is a white seal on the inside of each lid to ensure they are air tight and leak proof! The glasses and lids are Lead free and BPA free.